No matter what I do, I can’t outsmart a basil plant. I’ve tried pinching back the flowers, keeping it in a warm, sunny area, planting at the end of summer instead of the beginning. But even in our mild coastal California climate, basil knows it’s an annual, and its time is summer, not winter. Many herbs can be babied through the winter, but basil will have none of that. It will die come late fall, period. 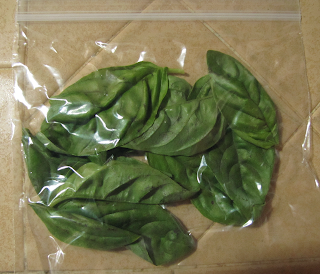 And so, since we have so much basil right now, I’m going to preserve some for winter. Of course, with modern food production, basil is available at the supermarket year-round. So why take the time to preserve it? First there's the usual locavore goal of eating locally to reduce our carbon footprint by cutting down on fossil fuels needed to transport the basil. You also might have a in-season basil source that is better than the out-of-season supermarket. Maybe it’s your own garden, a neighbor’s yard, or an organic farm, like our Route One Farms, where the basil is the most fragrant and delicious ever. Why not preserve some of the best in case winter supplies cost more while lacking in taste? Use the freshest basil you can find for preserving. Basil is delicate and can bruise or turn moldy easily, hence the argument over whether or not to wash it before freezing or drying. For me the choice is easy. Back in my college days I thought washing organic produce was unnecessary. “I’m not worried,” I remarked to my roommate, who instantly countered with “And neither was the rabbit who sh*t on it.” I have never again questioned whether washing organic produce is necessary. For the basil, I rinse off the dirt and remove any lower leaves that are slimy or seriously wilted. Then I blot it as dry as I can between two dishtowels. If it’s still wet I hang the stalks in a place where it’s warm and air can circulate: from rafters of a screened porch or in an airy indoor spot. It will dry in a couple of hours. One more word about basil. Some say that basil is the love herb, and that it can encourage the blossoming of love and affection when shared. In addition, just consuming it yourself can make you more loving and lovable. I don’t know whether this is true, but if you’re planning a romantic dinner, a little basil in the salad couldn’t hurt. It takes some effort to cut the basil, but you don’t have to dry it first. 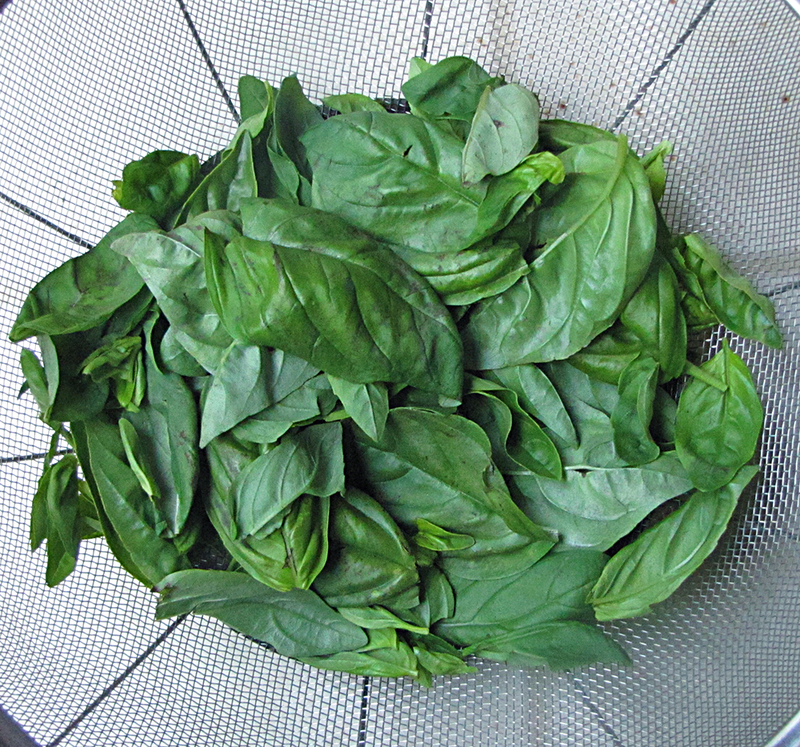 Remove basil leaves from stalks, discard stalks and chop leaves. The easiest way to do this is to 'stack' a few of them and use the kitchen shears to cut into strips. Using an ice cube tray, put about 1 tbsp. basil in each “cubicle” and add just enough water to cover the basil and freeze. When frozen, remove cubes to a ziplock bag and store in freezer. 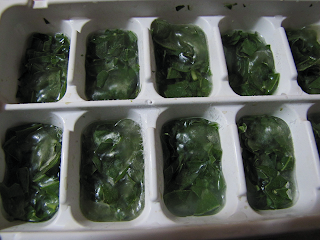 When you want to cook with chopped basil, add 1-3 basil cubes to whatever you're making. The water will cook away readily. This method is from Debbie, semi-retired recipe queen at Live Earth Farm. This method is simple and direct, but you must make sure the basil is dry first. 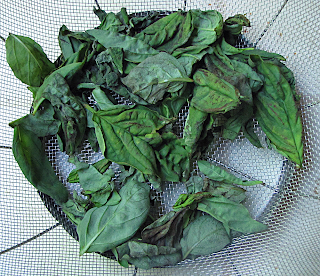 Pluck clean and dry basil leaves from stems. 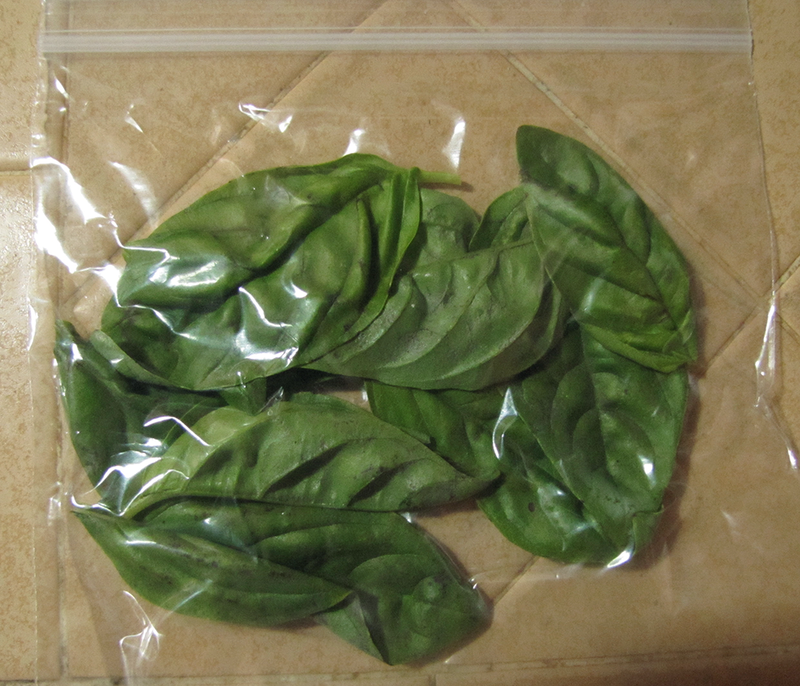 Put leaves in a plastic zip-lock bag, remove air, seal, and freeze. Do not thaw before use. 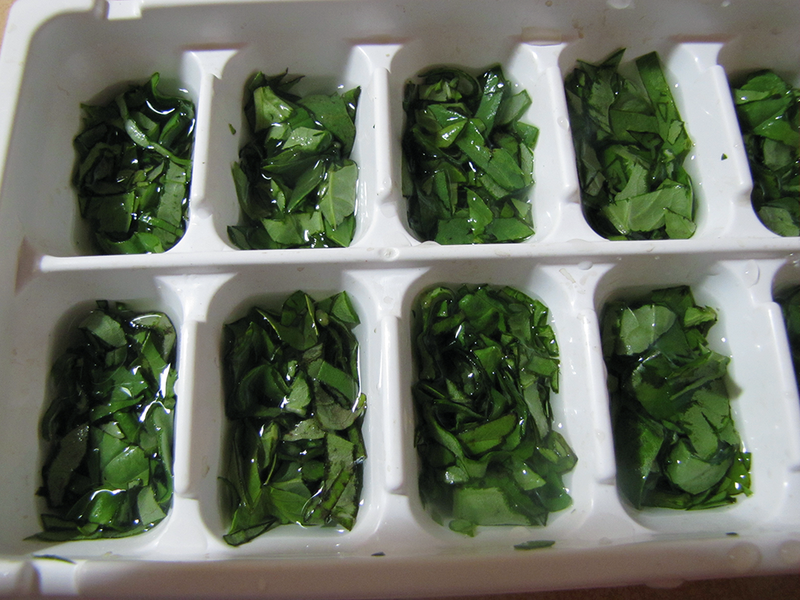 You can use kitchen shears to cut up the frozen leaves, or add whole to soups, stews, etc. This method is from the cookbook "From Asparagus to Zucchini: A Guide to Cooking Farm-Fresh Seasonal Produce." 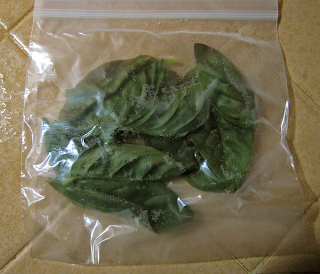 Unfortunately, either freezing method changes the leaves so that they’re too limp for pesto or other fresh uses. However, they taste great in dressings, stews, sauces, etc. After washing and drying the basil as above, remove leaves from the stems. Place them very loosely in a wire screen colander. Keep them in a warm dry place, tossing the leaves a few times a day. Air must circulate and they must dry evenly to prevent mold. If you store them outdoors, cover colander with cheesecloth held in place with a rubber band. Be alert for rain or damp weather, and bring colander indoors at night. A warm indoor spot, especially with good air circulation, will dry the leaves almost as quickly, without weather concerns. Keep them out of direct sunlight in either case. 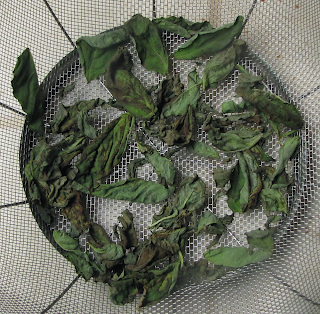 Leaves are ready to store when completely dry and brittle. Crumble and store in a jar. This can take from a day or two in warm dry climates to a week or two in cool moist climates like the Bay Area. If your area is cool and damp, try drying a small amount at a time. Fewer leaves will dry more quickly. A checkout clerk at our local natural foods store suggested tonight that I could grind up the dried basil to a powder and carry it with me, presumably to season various foods during the day. That’s an idea worth pursuing!